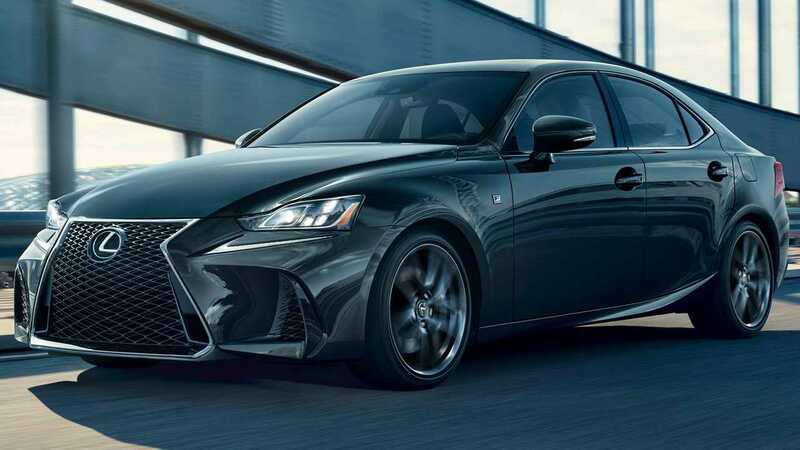 The 2019 Lexus IS 300 F Sport Black Line Special Edition adds a slightly more stealthy appearance to the sedan. The package comes with additional standard equipment, too. However, the automaker is only building 900 of them for the 2019 model year. The Black Line Special Edition rides on a set of 18-inch, split-spoke wheels that have what Lexus calls a black vapor chrome finish. The gunmetal-like color also appears on the wheels for the latest LS sedan. As a tinier upgrade, the model has black mirror caps. Buyers can order the exterior in Ultra White, Obsidian black, and Atomic Silver. LED headlights come standard with this package, too. On the inside, the Black Line Special Edition looks sporty due to its combination of black seats with red accents on the bolsters, cushion, center console, and armrests. Drivers grip a heated steering wheel with black wood trim. The package includes navigation as a standard feature, too. The Black Line Special Edition is available on the rear-drive IS 300 for $44,800 (plus $1,025 for destination) with the 2.0-liter turbocharged four-cylinder that produces 241 horsepower (180 kilowatts) and routes through an eight-speed automatic gearbox. Buyers looking for a little more traction can get the darker look for $46,850 on the all-wheel-drive model where the equipment comes with a 3.5-liter naturally aspirated V6 producing 260 hp (194 kW) and running through a six-speed automatic. The IS 300 F Sport Black Line Special Edition goes on sale in the United States in March. Available on both the rear-wheel drive and all-wheel drive IS 300 F SPORT models, the Black Line Special Edition has several exterior features that set it apart from the standard IS 300. Most notable are the 18-inch, split spoke wheels with a “black vapor chrome” finish, a technology shared with the wheels on the flagship LS sedan. To complement the darker wheels, the Black Line Special Edition also comes equipped with black side mirrors regardless of body color. There are three exterior color options to choose from: Ultra White, Obsidian and Atomic Silver. To give the interior the mark of a true Special Edition, all Black Line models come with black Nuluxe seats with red accents on the side bolsters and seat cushions. There are additional red accent panels on each side of the center stack along with contrasting red stitching on the seats, center console and armrests. Also included is a heated, black wood-trimmed steering wheel that features distinctive shades of black that were created by a Japanese calligraphy shop dedicated to perfecting ink for more than 200 years. All Black Line models come equipped with Navigation and triple beam LED headlamps. Rear-wheel drive versions of the IS 300 Black Line Special Edition are powered by a 2.0-liter, turbocharged, four-cylinder engine that sends up to 241-horsepower through an eight-speed automatic transmission. The all-wheel drive version of the Black Line Special Edition uses a 3.5-liter V6 with 260-hp and a six-speed automatic transmission. Production of the 2019 IS 300 Black Line Special Edition started in early February, so dealers will have examples in showrooms starting in March.